Some of the Moto E5 series phones have already been launched in the United States like the Moto E5 Plus and Moto E5 Play. However, the Android Go-powered Moto E5 only hit the shelves recently. 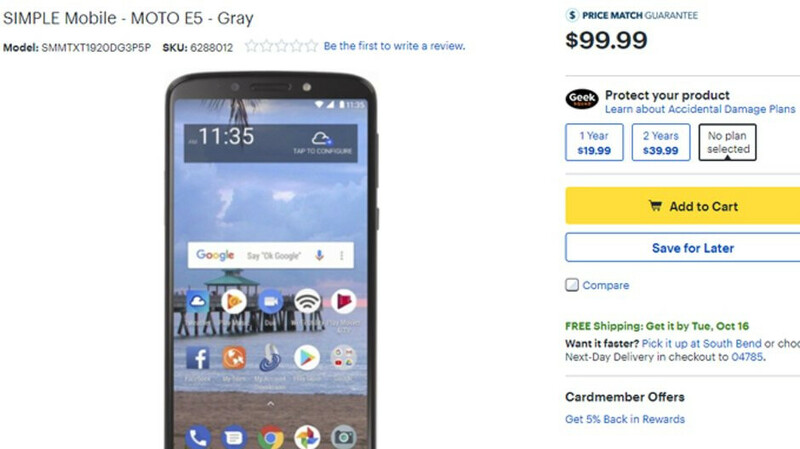 You can't just buy one from Motorola's online store, but if you really want the Moto E5, you'll be able to get one from Best Buy via prepaid carrier SIMPLE Mobile. The smartphone costs just $100 and it's only available in gray color. Despite its low price, the Moto E5 is a pretty decent budget-friendly smartphone thanks to a Snapdragon 425 processor, coupled with 2GB RAM and 16GB expandable storage. Obviously, the phone runs Android Go, which is a lighter version of the Android Oreo, specially tailored for low-specced smartphones. The rest of the phone's specs include a large 5.7-inch display with HD+ (1440 x 720 pixels) resolution and 18:9 aspect ratio, an 8-megapixel rear-facing camera, a secondary 5-megapixel selfie snapper, and a large 4,000 mAh battery. Although it costs a bit more than the Moto E5 Play, the Moto E5 offers lightly lower specs, so keep that in mind if you've decided to go for a Moto E5 series phone. Lower specs? Pfft!! This has NFC on a budget!!! If I were in the States looking for a prepaid phone, I'd snap one of these up and unlock it for use up here in Canada!! !